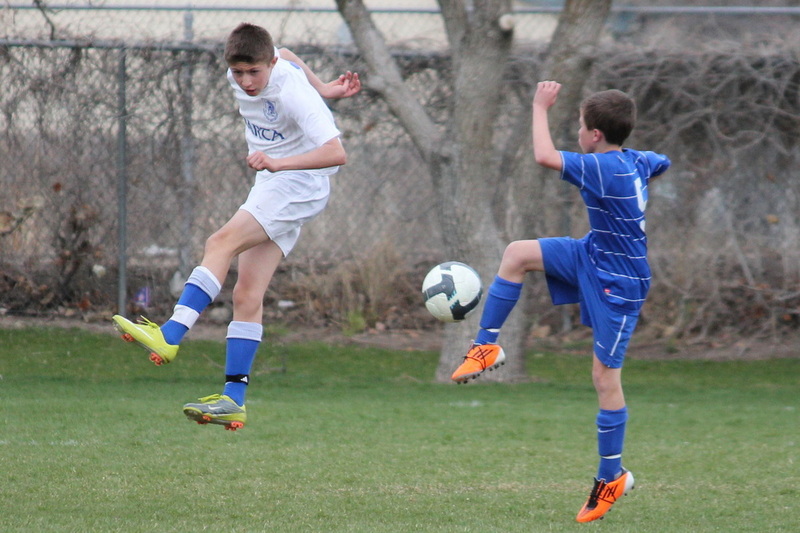 State/club games are on an individual basis. If you cancel, please let Torri know asap. Unfortunately, right now, the air is unhealthy. The wind is supposed to stay the same direction until about about noon. Then it will go directly north which could reduce it a small amount. It is not forecast to blow out until later in the afternoon when winds will increase and direction will change. Because the smoke is still here, and is unpredictable whether it is effecting us, we are going to once again( I know, but sorry), wait until 7:00am to see if the winds clear the valley. Although we love soccer, we love our kids more. Since currently, smoke is at a unhealthy level, we are cancelling all recreation (challenger) and all AA Games. Although it will probably clear up later when the winds pick up, we are not going to gamble. 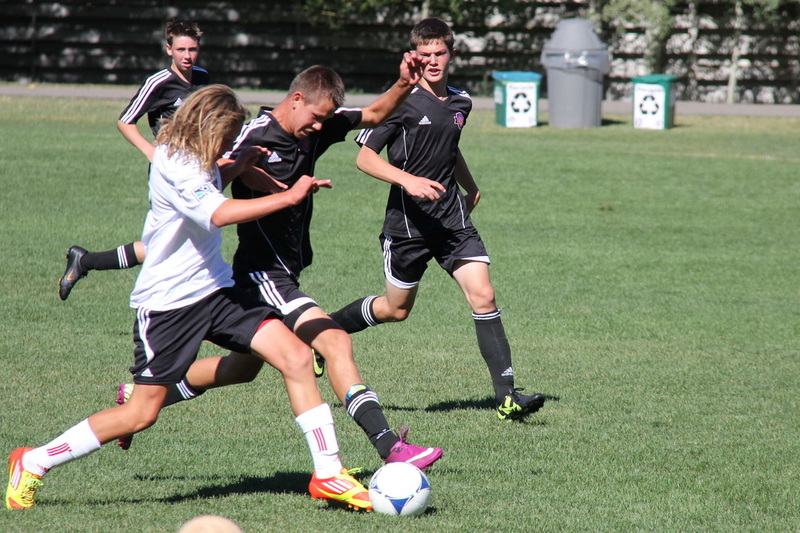 State/Club teams need to contact the other coach. And make an individual decision. 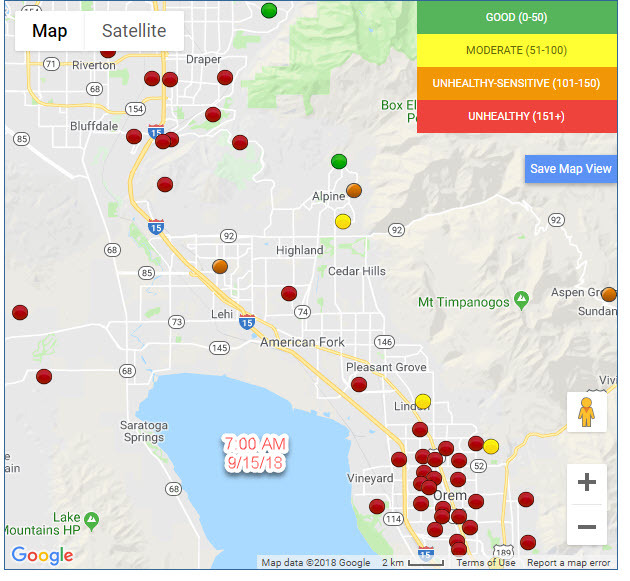 All indications are that the North Utah County area will be free of smoke and almost all particulate matter saturday. We are planning on all challenger games continuing on as scheduled and all competition home games continuing on. Away games on unless you hear from other team. ​In the unexpected event that things change overnight, this page will be updated at 7:00 am. Both of these sites indicated very unhealthy air this morning, but perfectly healthy air this afternoon. I am not a meteorologist, and not even very bright; however, I did a little research as we were trying to decide what to do about games tomorrow (particularly after it completely cleared up). What I discovered is that there were a few hours this morning (which were actually forecasted) where the winds were from the south going north. Thus, we had smoke from the Spanish Fork area fires. There is a forecast for the next few days of winds of 7-17 mph, but all these winds are forecasted to be from the north going south. I like analogies. Spanish Fork is the campfire. This morning we had the bad luck of being where the smoke was blowing away from the campfire. Currently, and forecasted for tonight and tomorrow is that we are on the smokeless side of the campfire. And as you know, one side of the campfire can be much different than the other. 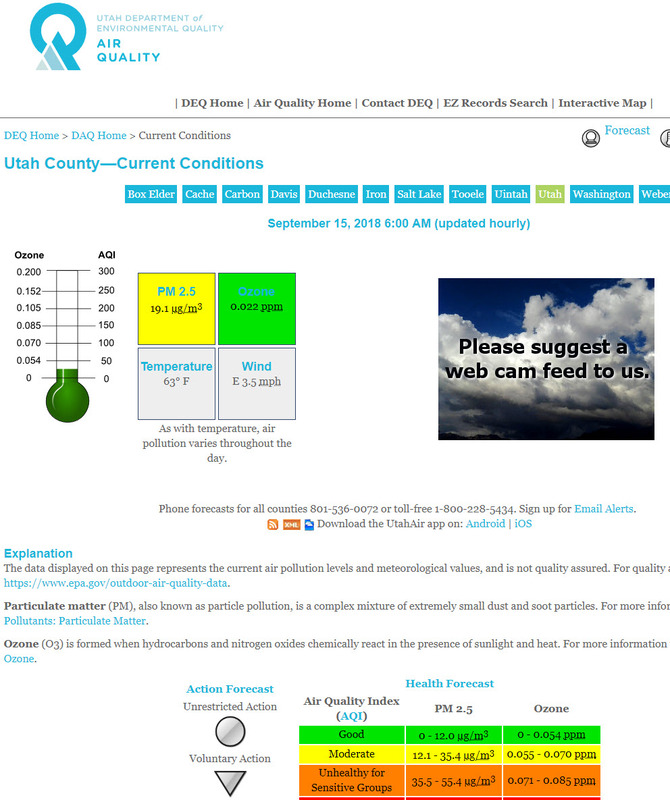 The KSL reference above is very helpful because it doesn’t throw the NUCS field and gaming area into the same air quality as Spanish Fork. If you look at “Utah County” air quality, it is dangerous, but that is only looking at the downwind side of the campfire: Spanish Fork. Our air is currently great and forecast to remain so. So, we will update the home page of the nucsonline.com website at 9:00 pm tonight. We most likely will indicate that games will continue, but if the forecast changes, or is even forecast to be unpredictable, we may indicate at 9:00 pm that games will be cancelled for health reasons on Saturday. If we cancel the games at 9:00 pm, they will not be uncancelled even if it clears up. We are trying to do our best, so, sorry if we cancel and then it is beautiful. Right now, it is expected that we will play our regularly scheduled Challenge (Recreation) games and our regularly scheduled AA/District and State/Club games. However, if you have a competition game scheduled south of provo on Saturday, expect that your game may be rescheduled. I have been able to confirm that Hillman field is currently a staging ground for firefighters besides having horrible air quality. The health and safety of our kids is our number one objective. for administrative purposes it's in 2 groups, Challenger I (ages 3 - 6) and Challenger II (ages 7-18). Children from Lindon to Saratoga Springs are welcome to join. Cost $100 for a 14 game spring and fall season. ​However, there is a $10.00 early registration discount before May 17th. 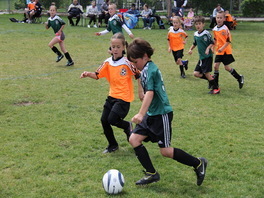 ​Cost is $140-$245 for a 10 game fall season and a 7 game spring season followed by a tournament.